The rescue at Sunset Cliffs on Dec. 27, 2018. 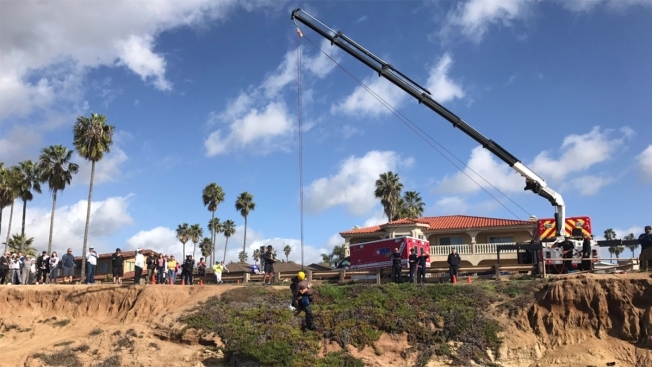 Using a crane and a fire truck, San Diego lifeguards hoisted a person in distress off the rocks at Sunset Cliffs Thursday, officials said. The rescue happened around 11:30 a.m. The San Diego Fire-Rescue Department (SDFD) said the person being rescued had been swept off the rocks. As a lifeguard hoisted the person out of the cliffs, the pair dangled from a rope secured onto a crane. Onlookers could be seen watching the rescue.